The OXYNET Website was set up in 1998 as a result of a large-scale multinational (European Commission funded) project by HBO specialists in Europe. In 2005, it has been co-opted by the European Committee for Hyperbaric Medicine (ECHM), and the information on HBO provided on this website has been integrated in the scope of ECHM's objectives. Although some essential information remains hosted on the OXYNET website (as a tribute to the first large-scale HBO-communtiy collaboration), much more essential information is available at the ECHM site, www.echm.org. We therefore strongly recommend to bookmark the ECHM site (also) as reference site for obtaining professional information on Hyperbaric Oxygen Therapy. This site has been set up with the support of the European Commission, under the COST (Cooperation in Science and Technology) Programme. 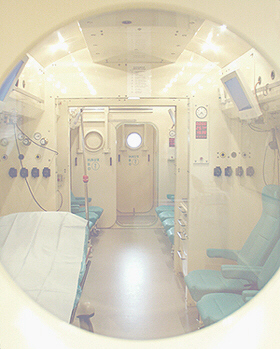 It is part of COST Action B14 : Hyperbaric Oxygen Therapy. It is a European "Portal Site" for Hyperbaric Oxygen Therapy: on this site you will find all possible links and useful information in relation to HBO.